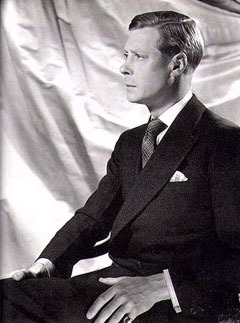 After the death of his father, King George V, Edward VIII assumed the throne of England on 21 January 1936. Not even a year later, Edward was forced to renounce the throne due to his intentions of marrying his American mistress, Wallis Simpson. At the time, Simpson was still married to her second husband, Ernest Aldrich Simpson, a shipping magnate. Edward abdicated on 10 December 1936, his younger brother Prince Albert becoming King George VI two days later. Edward and his wife were Nazi sympathizers, visiting Germany as guests of Adolf Hitler in 1937. After the war, he and his wife settled in France.